My friend's son was sporting a pair of these shoes last weekend, and I just had to share the cuteness that is Tiny TOMS. 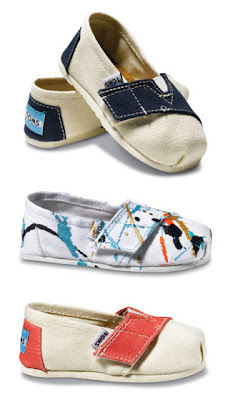 And for every pair you purchase, TOMS will give a pair to a child in need. One for one. These shoes are very cute. I am a big fan of TOMS shoes. Great company, great cause, and great shoes! How fantastic is that? Do they always give one for one or is that a limited charitable contribution? Those are the most adorable little shoes. Nice trade, too.